About: Gita Pita offers fresh, delicious and authentic Mediterranean cuisine. Gita Pita isn’t entirely vegan when it comes to the standard fare, but they do have good vegan options, and they offer a slightly different take on Mediterranean food than others in town. 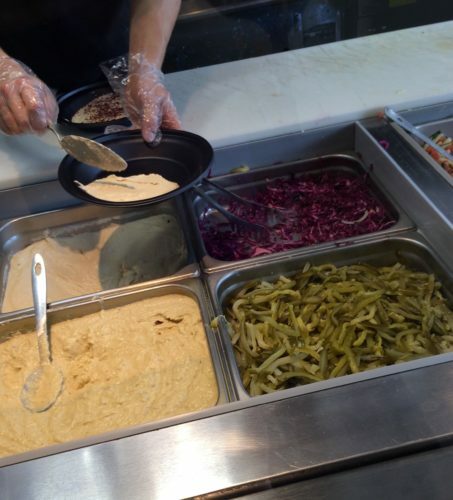 They also have some of the best falafel you’ll have here for a great price. One of their options is a “Fattah bowl.” The bottom is filled with hummus then topped with vegetables and falafel (if you choose). It comes with a side of fresh cooked pita bread. The pita bread is pretty unique. Raw dough is slapped onto a device that is some sort of fast cooking dough contraption. What comes out is a thick, doughy, delicious slab of bread. There’s also a Veggie Sampler that comes with hummus, baba ghanooj, falafel, red cabbage, and harath salad (made up of tomatoes and cucumbers). Up until November 2015, the baba ghanooj had a small amount of sour cream mixed in. We are happy to report that due to numerous requests, the sour cream has been removed and it is now 100% vegan. You can also order a veggie or falafel sandwich. The basmati rice is also vegan, made with vegetable stock, as is as the lentil soup. You can also get fattoush salad or tabouli. The only thing missing from the menu are grape leaves. A huge bonus is that Gita Pita doesn’t deep fry any meat, which means anything fried is vegan-friendly. 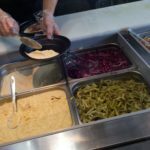 That means that you can enjoy the falafel, fries, and pita chips without worrying about cross-contamination. One of the few (maybe only?) Mediterranean joints in town that doesn’t have a shared fryer. One word of caution – the tahini sauces are not-vegan, so avoid them.